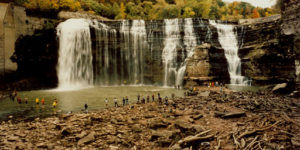 Given the great promise of the Falls and in the face of the nation’s great need for the possibilities that industrialization could unlock, it would seem selfish and short-sighted to not make use of this great natural wonder. 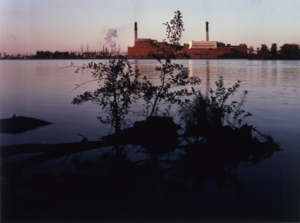 But, once taken advantage of, the Falls and the River’s banks would become what the photographer, John Pfahl called an “altered landscape.” Today, we might also define it as a sacrifice zone, akin to those of the West. 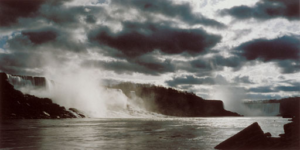 Although the area of the Niagara Falls has not been poisoned and polluted as the desert lands, it is still undeniably spoiled as a natural wonder. What is left of Niagara Falls, now greatly changed by the demands of modern life, is largely due to efforts to conserve what could be salvaged of its beauty, efforts that date back to the mid-nineteenth century? 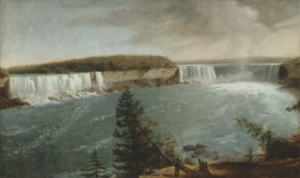 It is in the midst of the ongoing controversies about the preservation of Niagara Falls versus the exploitation of its resources that George Inness painted Niagara Falls. 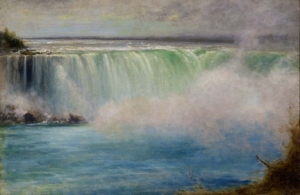 Although Inness did his best to obliterate or ignore the visible impact of industrialization, his was a vista very different from that seen by John Vanderlyn, a young artist who visited the Canadian side of the Falls on the recommendation of Aaron Burr. Burr had visited the Falls with his daughter and Vanderlyn was looking for the kind of art that would make his name and make some sales along the way. The other excellent source for understanding the role America plays in the contemporary concept of “Arcadia,” is Leo Marx’s The Machine in the Garden. In fact, he opens his book by conjuring up the pastoral ideal and how it fed the American dream. “The pastoral ideal has been used to define the meaning of America ever since the age of discovery, and it has not yet lost its hold upon the native imagination. The reason is clear enough. The ruling motive of the good shepherd, leading figure of the classic, Virgilian mode, was to withdraw from the great world and begin a new life in a fresh, green landscape. And now here was a virgin continent! Inevitably the European mind was dazzled by the prospect. With an unspoiled hemisphere in view, it seemed that mankind actually might realize what had been thought a poetic fantasy. Soon the dream of a retreat to an oasis of harmony and joy was removed from its traditional literary context. It was embodied in various utopian schemes for making America the site of a new beginning for Western society. In both forms — one literary and the other in essence political — the ideal has figured in the American view of life..” Therefore, it is the ancient ideal of Arcadia and the more modern idea that America was the new Arcadia, against which we measure our environment today. 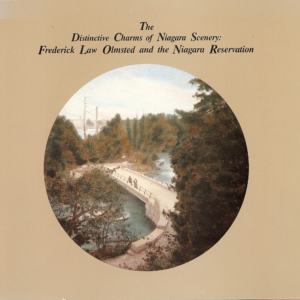 It is interesting to note that Olmsted’s attempts to return Niagara into some parklike version of Arcadia did not take industrialization into account. The landscape architect’s chief concern was the commercialization brought on by tourism and the resulting clutter that offended his rather patrician soul. 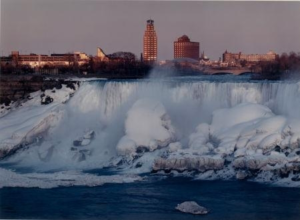 As Sears pointed out, “By the 1860s and 1870s, the commercial version of Niagara as a spectacle had threatened to swallow every other experience of the Falls. Olmsted’s plan for the reservation made room for the genteel tourist but defined the proper experience of the Falls as picturesque contemplation rather than sublime excitement..Thus Olmsted provided an alternative mode in which tourists could consume the Falls as a cultural product. 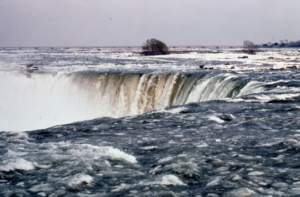 But he didn’t defeat the sensational version of the Falls that continued to operate from the periphery of the Niagara Reservation. 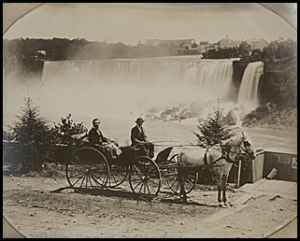 The two versions of the Falls settled down side by side to vie for the attention of visitors.” As Sears later pointed out, at the turn of the century, there was very little concern from the general public about encroaching industrialization, even upon a place as “sacred” as Niagara Falls. In a related series on Waterfalls, John Pfahl trekked to the system of gorges and waterfalls that configure upstate New York. In writing of his photographic decisions, he stated, “Waterfalls photographed close-up and isolated all look very much the same. I chose a panoramic format and wide-angle lenses to provide context and to complicate the meaning and formal qualities of the images.” Once again, Pfahl distanced himself from politics and situated his work in the task at hand: measuring the uses of waterfalls in the East. 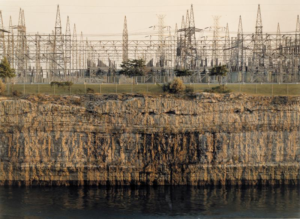 Here, the story of Niagara was repeated: the surge of tourists who wanted to experience nature, supposedly untamed, and the harnessing of Nature for the purpose of producing power for American industry. Niagara and the adjacent waterfalls make light bulbs turn on, machines hum, and generators to throb. Ironically, in the early twenty-first century, this kind of power–water power–is recognized as a safe clean form of energy, along with solar and wind power. 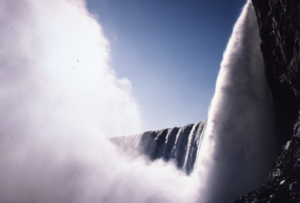 Water power is also one of the most venerable forms of using the land productively, going back to primitive medieval manufacture along the banks of streams and progressing to windmills in Holland and moving to the banks of the Niagara River.